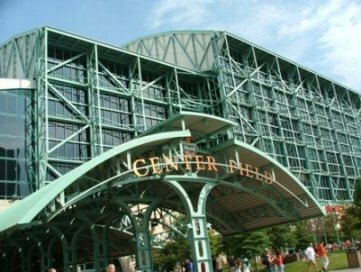 The above pictures are from the outside of Minute Maid park. 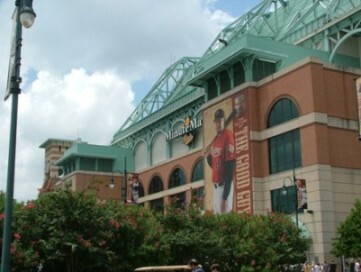 The one directly above was in 'Halliburton Plaza' (oddly enough) and was a 90 foot area that represented second base to first base - with a statue of Craig Biggio at second (in the far part of the picture) and a statue of Bagwell at first (near part of picture, with girl in red striped shirt). 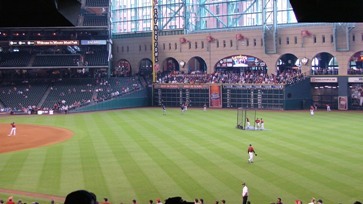 People were lined up to take these pictures (you can see the line behind the Biggio statue). Onion tour - aces for Astros. Not only three things of real onions, but three things of real jalepenos. Other parks take note - stainless steel and neatness and REAL onions! 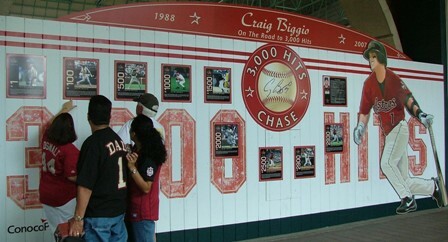 Craig Biggio made it to 3000 hits and was retiring this year (2007). 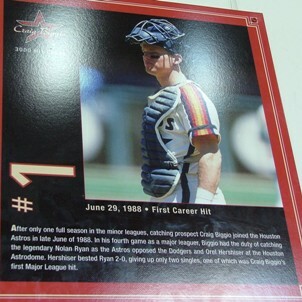 His first hit was as a catcher in 1988 - he was catching Nolan Ryan. 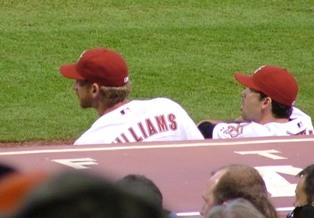 Biggio played catcher, 2nd and center field in his career. 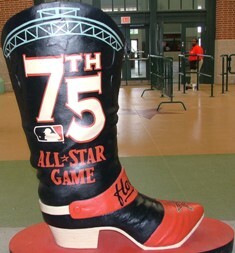 Souvenir from the All-Star Game. 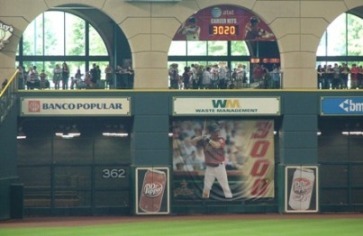 Biggio hit counter above the 3000 poster. AND above the bull pens. Long story about how I found out they were hidden in left field. One usher tried to convince me that the dugouts were the bull pens. Where do they get these people? 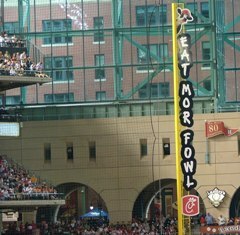 The train above is pulling oranges (get it - Minute Maid park). 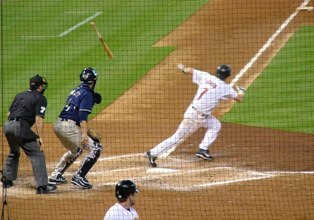 Any way, it toots and goes when an Astro hits a homer. I did get to see it and took a video, but because of the lighting you can't really see the train, and because of the sell out crowd - you can't really hear it, either.... If you REALLY want to see it, let me know and I'll email it to you. One of the oddest mascots - Junction Jack. I guess he was supposed to be a Jack Rabbit. 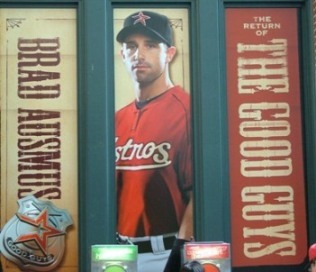 I guess they can't really have an orange or a comet (Astros) as a mascot, but this guy was odd. 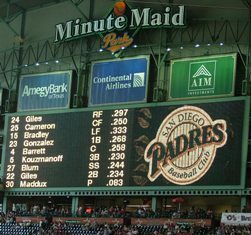 Starting lineup for the Astros. 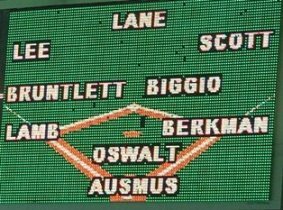 They gave away Roy Oswalt on Tractors that day - luckily I got there early because I wasn't sure where I was going (and I was bored). It was a sell out and there were actually fights over the souvenirs. 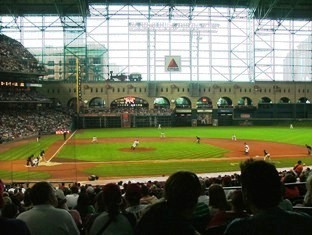 One of Biggio's many hits. 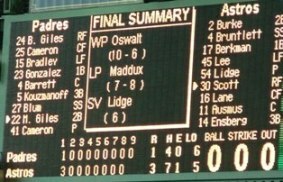 Final score - hope I didn't give away the ending with my comment about Maddux earlier.